Endometriosis is a very painful condition in women, which is caused by endometrium, which are the tissues lining the inside of the uterus, growing outside the uterus. It usually involves the ovaries, the tissues lining the pelvis or bowel. It is only on rare occasions does endometrial tissue spread beyond the pelvic area. The displaced endometrial tissue acts as normal; it thickens, tears down and bleeds with each menstruation. Since this displaced tissue has no way to leave the body, it is entrapped. 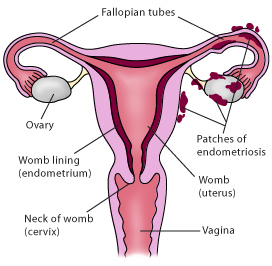 Where endometriosis involves the ovaries, cysts may form. The surrounding tissues become irritated, leading to scar tissue and adhesions. Endometriosis may result to pain particularly during menstruation. It may also cause fertility related issues. Pelvic pain that occurs during menstruation. The associated pain is usually intense and persistent than the one caused by cramping. Pain may be experienced before and after period and may come alongside lower back and abdominal pain. nausea or bloating usually during menstrual periods. Irritable bowel syndrome (IBS). When IBS accompanies endometriosis, diagnosis can be very difficult. Retrograde menstruation: This is the most probable explanation for this condition. It entails the flow of menstrual blood stained with endometrial cells back into the pelvic cavity through the fallopian tube. Instead of being ejected from the body, the displaced endometrial cells attach to the pelvic walls and on the surfaces of pelvic organs, where they develop, thicken and bleed during each menstrual cycle. Embryonic cell growth: cells lining the pelvic and the abdominal cavities come from embryonic cells. Sometimes one or more areas of the abdominal lining change into endometrial tissue, thus endometriosis can occur. Surgical scar implant: after an operation such as C-section, endometrial cells can attach to a surgical cut. Endometrial cells transport: the blood or the lymphatic fluid may transport endometrial cells to other body parts. Immune system disorder: the immune system may not be perfect, thus make the body unable to identify and destroy endometrial tissue growing outside the uterus. Endometriosis normally occurs long after onset of menstruation and the symptoms disappear temporarily with pregnancy and varnish completely with menopause. Endometriosis Related Infertility-Almost half of women with endometriosis have problems getting pregnant. Endometriosis may block the fallopian tube and hinder the egg from being fertilized by a sperm. It may also affect fertility indirectly by damaging the egg or the sperm. However a woman may still get pregnant and carry it to term. Doctors usually advise women diagnosed with endometriosis to have children as soon as they can as the condition may deteriorate with time. Ovarian Cancer- Endometriosis increases the likelihood of developing ovarian cancer. Even though ovarian cancer lifetime risk is minimal, endometriosis increases that risk. Physical clues of endometriosis can be achieved through a pelvic exam, an ultrasound or laparoscopy (a surgical procedure that entails an incision through the abdominal wall). Treatment of endometriosis normally entails medication or surgery. The approach taken by a physician depends upon the extent of your symptoms and plans of getting pregnant. Medication is usually recommended and surgery is mostly considered as a last resort. Generally, endometriosis affects women in their reproductive years. If having difficulties becoming pregnant, it is good to have an endometriosis diagnosis as it is highly associated with infertility. Early diagnosis of the condition is necessary for appropriatetreatment and easy management.